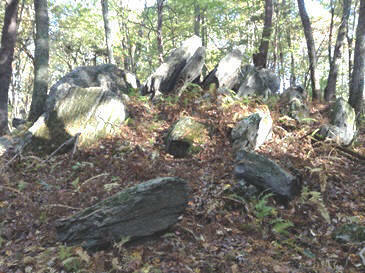 The jagged outcrop of vertically-layered boulders shown in Figure 1 may be the source of the rock slabs that form the roof of the Nashoba Brook Stone Chamber, located half a mile downstream from the quarry site. While restoration of the Nashoba Brook Stone Chamber (a.k.a. the Potato Cave) was underway in 2004, project specialists remained alert to possible sources for its roof slabs. There are nine of these, roughly square or rectangular in shape, and of different sizes. Each, on average, is a foot thick, with two parallel, fairly flat sides. Some may weigh a ton. They do not appear to have been manually shaped with tools. Their size implies a nearby source; their mineral composition, a specialized one. Some surfaces show weathering. These characteristics, taken all together, strongly suggest that their source was an outcrop of layered rock, i.e., of sedimentary composition. The chamber’s walls are laid up with field stones generously supplied from the site’s surrounding area, both in the nearby streambed and from the ground itself, lying mostly where the glacier left them. But there is no obvious nearby source for slabs of rock of the size and shape of those used to construct the roof. Rounded boulders would not have served, as irregular bulges would have made overlapping them difficult, and without careful overlapping, water collecting on their surfaces from rain and snow would not have drained away from the interior of the chamber. Additionally, wide slabs were needed to span the walls of the corridor and the interior room from side to side. Our chamber’s roof displays both perfect drainage and careful spanning of the walls. See Figure 2 for a plan drawing of chamber. Since the natural first assumption would be that any such stratified stones would have been found in fairly horizontal positions, the question was raised as to how the lot had been taken out of the bedrock in which they had presumably been embedded. And, further, how could their sides and edges have become weathered, and not be smooth and sharp as they would have been had they been chiseled, or otherwise forced, out of a horizontal bed of rock. We know that the Egyptians, Easter Islanders, the Incas, various Mesoamericans, and the builders of early stone circles such as Stonehenge did quarry stone. And so did the Colonists. Native Americans also did so. They used a passive quarrying technique: water was poured into naturally occurring cracks in bedrock which were subsequently subjected by the weather to alternate freezing and thawing. By placing wooden wedges into the widening cracks each year, these would gradually widen into fissures that could be used to fracture large portions of the original stone into smaller pieces. But the weathering observed on the surfaces of the chamber’s roof slabs make this quarrying technique seem unlikely. During the chamber reconstruction period, one of the many volunteers was a physician and amateur geologist who commented, as our masons had already told us, that the stone in the roof slabs did not match the granite in the large quarry located nearby in the Acton Town Forest along Quarry Road. Serendipitously, a short time later, some of the restoration project participants were bushwhacking through the land that has since become the Robbins Mill Conservation Land, looking for possible Native American stone features, when they stumbled upon the vertical rocky outcrop pictured in Figure 1. Large gaps between some of the vertical slabs suggest that a few of the presumed original slabs are missing; others lie on the ground where they fell, eroded loose over the eons by wind and water. No funding was available to perform a scientific analysis of the composition of these slabs relative to that of the roof slabs, but the same amateur geologist confirmed that the type of stone in the outcrop is a good match for that found in the roof slabs. 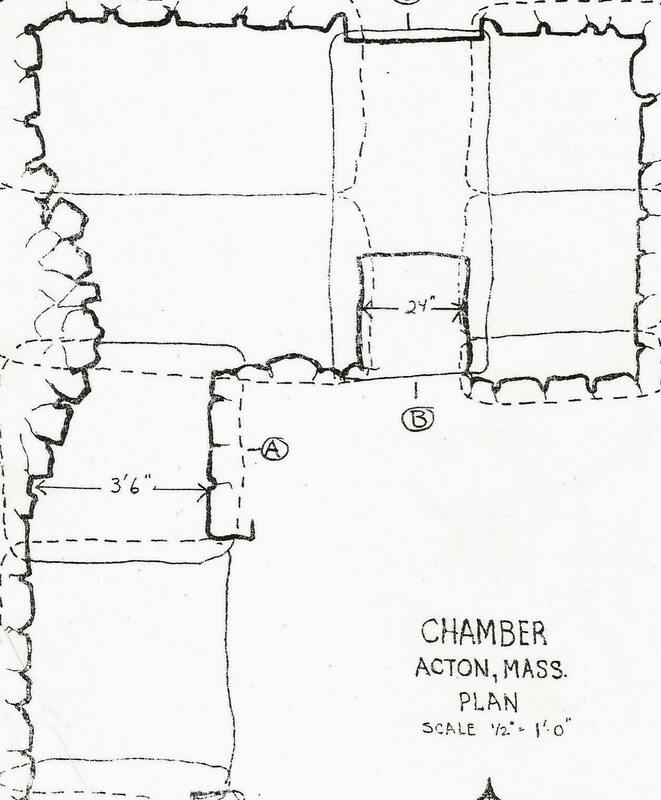 Considering the distance between the outcrop and the chamber’s location, together with the proximity of both sites to the Nashoba Brook, it seemed reasonable to assume that this small outcrop could have provided the chamber’s roof slabs. Large stones such as these could easily have been moved on log rollers down the slight gradient to the Brook’s nearby marshland. From there, during the winter, when the water was frozen, moving them the remaining distance to the chamber would not have been an extremely difficult undertaking. Builders sophisticated enough to have raised such slabs and set them onto previously constructed stone walls, without knocking those down, surely would have had the expertise to move the slabs in winter along the relatively short distance between the outcrop and the chamber. We cannot know for certain whether or not the outcrop is the source of the chamber’s roof slabs. Ideas present here are no more than educated guesses. No historical documents have been found that attest to whom the original builders of the chamber were, or when they did their building. But the facts that can be observed are surely consistent with a scenario that could have been carried out either by Colonial farmers with oxen, or by Native Americans without. That scenario demonstrates the kind of ingenuity displayed in the face of necessity that governed extraordinary building feats carried out even a few centuries ago without the technologies available today. The possible quarry site, while shown on the large TTT map, is not yet accessible by trail. It is expected that during 2014 a red access trail, from the current yellow TTT trail at the southerly end of the Wheeler Lane footbridge, will cross the Boy Scout Land into the recently acquired Robbins Mill Conservation Land to the site. Another route to the site is planned to lead out from the Carlisle Road parking area, from which an existing trail leads to a site overlooking the marsh where an observation platform will eventually be built. Funding for the informational panel on which this material will soon appear in the field was supplied by a vote of Town Meeting authorizing Community Preservation Act funds.